I’ve fed all three of my children baby formula. So far, I’ve been fortunate to never find the baby formula that I use to nourish my babies on a recall list or pulled from grocery store shelves. Last night, I read an eye opening article. It surprised me and made me more than a little sad about how far some people would go to make a buck. Earth’s Best Organic Soy baby formula has been pulled from the shelves of QFC and Fred Meyers stores in the Seattle area after a parent in Kirkland, Washington found that a label had been peeling away to show a label of a cheaper brand of formula beneath. My first thought was “Oh, factory mistake.”. I’m apparently a little naive, though, as Kroger (the owner of QFC and Fred Meyer) pulled the product off the shelf. Their reasoning for pulling was due to a far more insidious reason than my mistake theory: product tampering. I knew that formula was a high theft item from my days of working in a grocery store. I always figured it was either parents out to feed their kids or scammers selling the stolen property or doing fake returns. I never, ever dreamed that formula would be the subject of black markets or people deliberately putting higher priced product labels on lower priced formula. A spokeswoman for the company stated that the product has been pulled from al 233 stores in the chain. An investigation to determine how the tampered product made its way to their shelves is underway; while there is a black market for formula, the company takes steps to ensure that their product is legitimate. 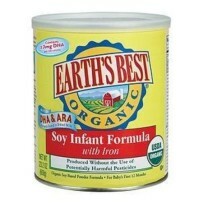 Customers who have purchased Earth’s Best Organic Soy formula are urged to return it to the store for refund or other product. Why do you tweet old articles? It’s misleading, especially in instances like this. It’s July 24 2013, yet this article was written Sept 2012. Not good for formula feeding parents who may now be needlessly worried about what they are feeding their babies.